Swarovski Crystal Limited Online Edition Lime Panther Officially Released! Exclusively available from April 14, 2012 onwards, Swarovski is proud to present the Limited Online Edition Lime Panther. This eclectic, eye-catching crystal sculpture is limited to 888 pieces which are only available from the Swarovski online shop. The Limited Online Edition Lime Panther is the third in a series of online exclusive panthers. Balanced and impressive, the sculpture captures a graceful poise and seduces with its exceptional color in perfectly faceted crystal. The Black Spot granite base sets a nice contrast and further underlines the strength inherent to these famed creatures. Graceful power combined with luxurious materials which better combination could possibly grace your interior? The Swarovski Lime Panther Online Limited Edition has a retail price of $1100.00 USD. The system number for the crystal Lime Panther is 1142792. Swarovski Soulmate Panther (clear) – 9600 000 074 / 874 337. Introduced in 2007 and retired in 2011. Swarovski Soulmate Limited Online Edition Panther (black) – 9600 000 151 / 1060325. Introduced and sold out in 2010. Swarovski Soulmate Moroda Panther (moroda) – 1096051. New release for 2011. Swarovski Soulmate Limited Online Edition Orange Shine Panther (copper-like) – 1096050. Introduced and sold out in 2011. The Limited Edition Black Panther (500 units) sold out in under 48 hours according to the Swarovski web site. The Limited Edition Orange Shine Panther (888 units) took about 3 months to sell out. The designer for the Swarovski Soulmate Panther figurines is Heinz Tabertshofer. All the crystal figurines are fully faceted animals attached to black spot granite bases. The online limited editions (black and orange shine panthers) are engraved in the granite base with a unique # and the words “limited online edition”. The Limited Edition Black Panther has been trading at favorable pricing to the seller on the secondary market, with selling prices in the $2900 to $3300 range. The Limited Edition Orange Shine Panther has been trading prices very close to original retail price….$1200 – $1400. I’m sure that crystal fanatics wish they had a crystal ball (pardon the pun) to know how this one is going to sell in the future…buy only one for their collection, or buy several in hopes of making a few bucks? (Reminder….Swarovski indicates on their web site that quantities are limited to 3 per person). I have purchased mine (just one). One thing for sure…you’ll want place your order now, so that you won’t have to pay secondary market prices to add this Swarovski Limited Edition to your crystal collection later. Swarovski has announced to its SCS members that they are releasing another Limited Online Edition Panther. The impending NLE release is for the Swarovski Lime Panther. The crystal brand’s article states that the Lime Panther is the third issue of the Eclectic Panther collection. The other two panthers are the Swarovski Black Panther available in April, 2010 and Swarovski Orange Shine Panther available in August 2011. All three Swarovski Soulmates panthers are Limited Online Editions with a maximum production of 888 units. When I initially heard the color Lime (Lime NC in the article), I immediately thought it would be a shade of green. However, when I see the pictures on the Swarovski site, to me, it appears much more yellow, like a banana yellow. There is no mention of the price, but I expect it to be similar to the other Swarovski Eclectic Panthers in the $900 – $1100 range. The Black Panther sold out in days. The Orange Shine Panther took several months to become a sell-out. It will be interesting to see the time frame that the Swarovski Lime NC Panther remains online prior to sell-out. It is worthwhile to mention that the crystal giant plans to impose a maximum quantity for purchase to 3 per person. I would think that if the company wants everyone to have a reasonable chance to purchase, that they should limit to 3 per address. 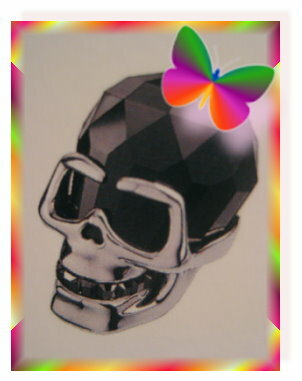 For Swarovski crystal fanatics ready to purchase the Swarovski Lime NC Panther, mark your calendar for April 16, 2012. For cat fanatics looking for the other Eclectic Panthers, Crystal Exchange America has the Swarovski Black Panther and Swarovski Orange Shine Panther in their online store in the ‘Limited Edition Swarovski’ category! It appears that Swarovski is putting a larger emphasis on the Men’s Collection in their marketing and advertising. Today, when I was at the Swarovski web site, I noticed the scrolling marquis (below the huge Hello Kitty frame) now contains a section labeled “Especially for Men” “N the Skull” with a feature picture of the new skull accessory. I think it’s great that men are becoming a target audience for product development, considering just how many male crystal collectors that there are. As for the Swarovski Skull figurine, I’m still a bit shocked by the masculine figurine. If you follow the link for Swarovski Men’s section, it leads to the first page of several for a Swarovski Men’s Jewelry line. On this jewelry page, the 2 different sized skull figurines appear. While I was surprised to find it mixed in with (men’s) jewelry, I was equally surprised that when I searched the store with the term ‘soul mate’ that the skull did not appear in the search results. After all, the retailer that shared the new product with me indicated that it was a part of the Swarovski Soulmates collection. In short, if you are looking to purchase the Swarovski Skull figurine, it may be easiest to find it on the Swarski web site by searching the term ‘skull’. Swarovski Soulmate Orange Panther – Crystal Limited Online Edition Arrived! The Swarovski Orange Shine Online Limited Edition launched online about 10 days ago for purchase. I quickly placed my order, not wanting to pay higher prices once it sold out. I was quite excited for it to arrive only 5 days after I got my order placed. I didn’t really know what to expect in an “orange shine” colored panther. I was thrilled once I was able to see it in person….I really like it! 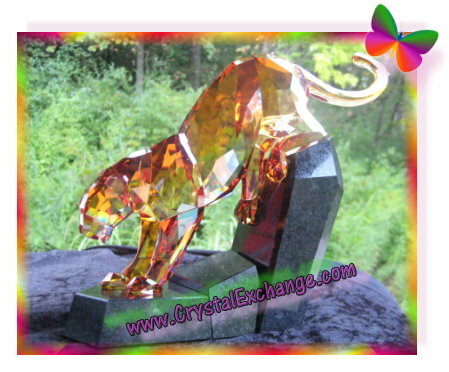 Now, the Swarovski Orange Panther is appearing everywhere for sale….there are at least five of them on ebay, and collectors are listing them with our service at Crystal Exchange America. Naturally, collectors are hoping to sell them for a profit, as the advertised prices are $1800 and up everywhere outside of the Swarovski shoppe. Honestly, I did think this Swarovski crystal panther would be sold out in just a few days. The panther was a well-liked design. The maximum production is low (888 units), and the price point is affordable. I thought this would be a winning combination for Swarovski crystal collectors. My thoughts now are that perhaps collectors are thinking three panthers are ENOUGH. Or perhaps, collectors are still a bit nervous about an ‘orange’ panther. In any case, we urge collectors to double-check with the Swarovski site before making a decision to purchase elsewhere. Some ebay sellers are reporting that it is sold out, when in fact, it is not. If there is a particular sequence number that is a ‘must have’, then the seller has the upper hand on pricing. If not, buy it where is it priced the lowest. The designer for the Swarovski Soulmate Panther figurines is Heinz Tabertshofer. All the crystal figurines are fully faceted animals attached to black spot granite bases. The limited editions are engraved in the granite base with a unique # and the words “limited online edition”. Swarovski Panthers have been sold in the following colors: clear, black, moroda, and orange. The Limited Edition Black Panther is trading at seller-prodfitable prices on the secondary market, in the $3000 to $3500 range. If this is any long-term indicator of success for the Swarovski Limited Edition Orange Shine Panther, you’ll want place your order now, so that you won’t have to pay secondary market prices to add it to your Swarovski crystal collection. 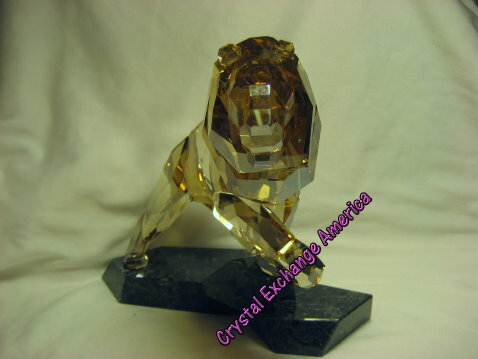 Should this occur before you get the Panther added to your collection, check out the the “Limited Edition Swarovski” category of our store at www.CrystalExchange.com . Swarovski Skull – Soulmate Crystal Figurine Officially Released! For all the crystal collectors who may have considered the possibility that the Swarovski Skull was a hoax, the doubt can be cast aside….‘N the Skull’, is now present in the online store! Our original Swarovski Skull article from July 30, 2011 is confirmed. The Swarovski Soulmate Skull is offered in two different sizes. The larger of the two is 4.25” tall. 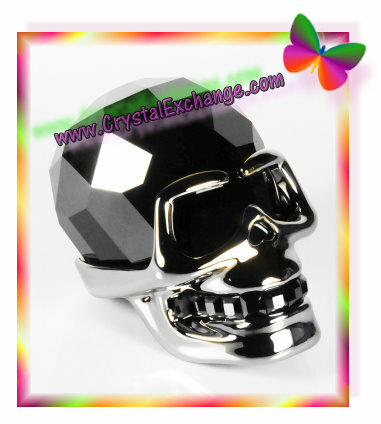 The system # for this Swarovski Large Skull is 1124219. This skull retails for $860. On the Swarovski site, they mention that the design is for men and it is suggested for display in the home or office. While the Large Skull does appear in the online store, it is not yet available to purchase. The smaller of the two is about 2.25” tall. The system # for this Swarovski Skull is 1124215. This skull retails for $370. On the Swarovski site, they mention that the design is for men and that it is a compliment to the ‘N the Skull’ jewelry range: two pendants and a keyring. This Small Skull is available for purchase now, simply by adding it to your cart and checking out. Both Swarovski Skulls are made of Jet Hermatite (Black) crystal, accented with ruthenium finish metal accents. The crystal brand currently produces one other large jet black crystal figurine….the Swarovski Jet Swan. I’m now wondering if there are plans for other masculine Swarovski crystal figurines, or if other large black figurines are in the works. Swarovski Orange Panther – Crystal Limited Online Edition Officially Released! This Swarovski Panther is identical in design to other panthers produced by Swarovski. That being said, this panther is Orange, and is limited to 888 units of production. The system number for the Orange Shine Panther is 1096050. This Swarovski Panther has a price tag of $1100. Swarovski Panther (clear) – 9600 000 074 / 874 337. Introduced in 2007 and retired in 2011. Swarovski Black Panther – 9600 000 151 / 1060325. Introduced and sold out in 2010. Swarovski Moroda Panther – 1096051. New release for 2011. The designer for the Swarovski Soulmate Panther figurines is Heinz Tabertshofer . All the crystal figurines are fully faceted animals attached to black spot granite bases. The limited editions are engraved in the granite base with a unique # and the words “limited online edition”. Get your order in quickly if you wish to secure your limited edition orange panther! The Limited Edition Black Panther sold out in under 48 hours according to the Swarovski web site. While this one has a higher price tag (about $110 more) and an increase in production of 78% more units, history could very well repeat itself with a quick sell out. The Limited Edition Black Panther is performing well on the secondary market, with trading prices in the $3000 to $3500 range. If this is any indication of success for the Limited Edition Orange Shine Panther, you’ll want place your order now, so that you won’t have to pay secondary market prices to add it to your Swarovski crystal collection. Swarovski Skull – Soulmate Crystal Figurine coming soon! Well, we always hear of new things, sometimes strange things, being embellished with Swarovski crystal stones. Never did I think that the crystal giant themselves would produce a Swarovski Skull figurine. To my surprise, they have! From information obtained from an authorized retailer, this Soulmate Skull is supposed to launch in August or September, 2011. The Swarovski Soulmate Skull is jet hermatite (black) crystal with silver colored accents and will be available in two different sizes. The larger of the two (Swarovski system # 1124219) is just over 4″ tall and will be in the price range of $850 – $900. The smaller of the two (Swarovski system # 1124215) is about 2″ tall and will be in the price range of $350 – $400. I was able to find Swarovski ‘N the Skull’ men’s jewelry and an ‘N the Skull’ keyring on the official Swarovski web site, so I believe this is a family of products. The Swarovski N the Skull keyring (system #1111589) retails for $140. The Swarovski N the Skull Pendant retails for $200 (system # 1111588) and Swarovski N the Skull Necklace retails for $450 (system # 1111587). I’m not so sure that I’ll be adding this “N the Skull” figurine to my collection, but it is certainly bound to spark some conversation within the Swarovski crystal collecting community. Swarovski Soulmate Panther (clear) – 9600 000 074 / 874 337. Introduced in 2007and retires in 2011. Swarovski Soulmate Limited Edition Panther (black) – 9600 000 151 / 1060325. Introduced and sold out in 2010. Swarovski Soulmate Panther (moroda) – 1096051. New release for 2011. Swarovski Soulmate Limited Edition Panther (orange shine) – 1096051. New release for 2011. The designer for the Swarovski Soulmate Panther figurines is Heinz Tabertshofer . All the panther crystal figurines are fully faceted animals attached to black spot granite bases. The limited editions are individually numbered and engraved in the granite base. So what are the differences between the Swarovski Online Limited Edition Panthers? As much as I know at this time, the colors are different and the production quantity is different. Swarovski Black Panther – Limited to 500 units. Swarovski Orange Shine Panther – Limited to 888 units. I have not heard any news about the price. The retail price on all the colors released to date has been just under $1000 each. The Limited Edition Black Panther is performing well on the secondary market, with trading prices in the $3000 to $3500 range. If this is any indication of success for the Limited Edition Orange Shine Panther, you’ll want to save the date of August 29, 2011 to try and purchase this newest one, so that you won’t have to pay secondary market prices to add it to your Swarovski crystal collection. Swarovski Satin Stallion Soulmates Horse coming July 11, 2011! Swarovski has announced to its SCS members about a new Soulmates Horse introduction, the Swarovski Satin Stallion. This Swarovski crystal horse was designed by Heinz Tabertshofer. It is made of satin crystal (like the limited edition Swarovski Satin Hare), and attached to a granite base, similar to the other Soulmates figurines. There is no mention of price, but many Soulmates figurines retail $800 – $1500 depending on the crystal figurine. Information obtained from a web site of an authorized retailer indicates that the price may be approximately $1025 USD. All the Swarovski Horse figurines are retired or retiring in 2011 except for one of the Zodiac Horses and the 3 Lovlots Horses, which were just released in March 2011. One of the largest horse figurines was the Swarovski Wild Horses, which was a limited edition figurine available in 2001. Only 10,000 were produced. Designed by Martin Zendron, it had a retail price of $4000 in 2001. 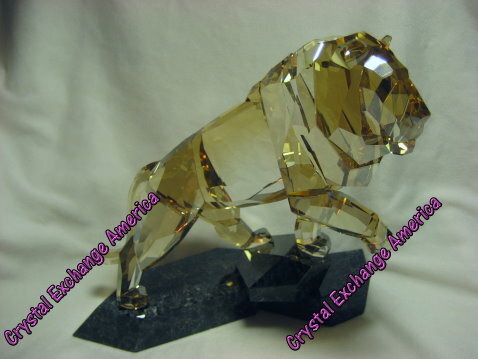 If you are a horse lover, check out the Crystal Exchange America web site at www.CrystalExchange.com and look in the ‘Animals’ category of the store for availability on any of the horse figurines. The Wild Horses figurine would be found in the Limited Editions category. 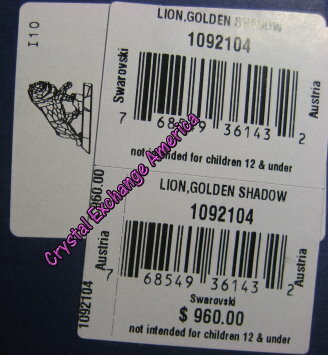 The Swarovski Golden Shadow Lion was released to Swarovski retailers near October 20, 2010. I was excited when mine arrived about a week later. I wanted to share some photos of this newest Swarovski Soulmate release with my collecting friends. The Swarovski system # is 1092104. The suggested retail price is $960. This magnificent Golden Shadow Lion came with a special black card, cleaning cloth, gloves, and generic blue certificate (like other Swarovski generic certificates). The designer is Mario Dilitz. The Swarovski swan logo is on the back right foot. The stunning Swarovski figurine has dimensions of 6 15/16 x 3 7/8 x 6 7/16 inches and stands on a base of mahogany granite. Other Swarovski Crystal sculptures in the Soulmates Collection include: Swarovski Maxi Swan, Swarovski Eagle, Swarovski Panther, Swarovski Black Panther, Swarovski Walrus, Swarovski Dolphins, Swarovski Lion, Swarovski Bull, and Swarovski Bear.